Are you the only one who cleans in your house? Do you constantly pick up items around the house (that normally aren’t yours!) and move them to where they belong? Is it your job to know that everyone’s clothes (and everything else everyone needs to walk out the front door) are ready for the next day? Are your family members always asking you where their things are? Most cleaning books will tell you to go it alone, and teach you tricks or shortcuts to make it more “enjoyable” or efficient. They show you a better way to do the job. Team Clean is different. Gone are the days of cleaning alone. It’s not all on you anymore! Carol Paul will teach you how to create a team made up of every member of your household. 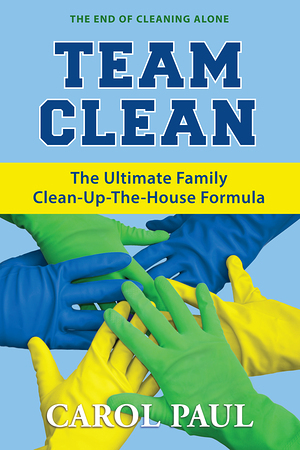 You will learn how to get that very team to clean your home for you once a week, all while creating a tradition that will change your family forever. Carol shares her simple step-by-step ways to make it happen, regardless of age, ability, or attitude. You will be amazed that you will finish the whole house in less than an hour without cleaning any other night of the week. She will help you create your own personal family-bonding element (she calls it “the reward”), and show you the life lessons and discipline you will instill in your children as a result. You could very well get back the family you dreamed of when you got married and first had kids!